Philips are delivering another POE Lighting Installation (Power over Ethernet). In a rapidly fast paced and changing lighting market Philips are leading the way with another POE Lighting installation. Taking place at the Clemson University in the USA, the major campus installation delivers flexible working spaces and maximum energy efficiency. You can read more about the installation here. POE lighting is set to really shake up the conventional way of thinking about lighting installations. With multiple light fittings simply plugging directly into a power of Ethernet switch via a pre made patch lead. This patch lead delivers both power and data to the fitting and enables individual control of each fitting across the network. Full analysis can be done from a head end system and individual area control can be achieved by staff through smart devices or other user interfaces such as switches, sensors etc. 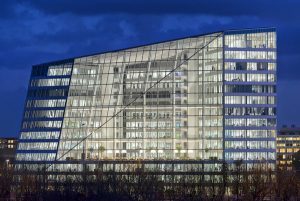 This new installation is on top of the already hugely successful installation at the Edge Building in Amsterdam which features a complete POE lighting system from top to bottom. Smartscape was lucky enough to visit this building earlier this year and has gained some great insight into the technology and where it is all headed. To learn more about POE lighting systems please contact us.